(L to R) Joe McDonald, regional vice president of Weichert, Realtors®; James Weichert, vice chairman of Weichert Companies; and Laura Metro, central relations manager for Residential Sales at Weichert, Realtors®, prepare to unveil the plaque dedication for the Weichert Room at the American Cancer Society Hope Lodge® facility in New York City. 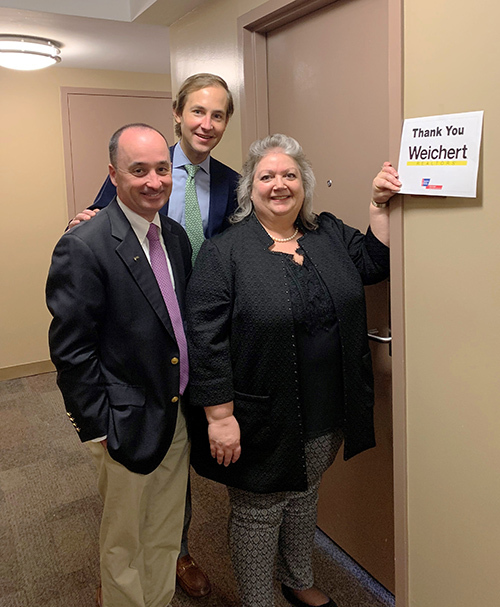 Weichert, Realtors® was recently honored by the American Cancer Society for its 18 years of continued support with the dedication of the Weichert Room at the American Cancer Society Hope Lodge® facility in New York City. The Hope Lodge® program provides a free home away from home for cancer patients and their caregivers. Through its annual Charity Golf Outing and other fundraisers held by Weichert’s residential sales offices, the company has raised donations totaling $1.412 million for the American Cancer Society and breast cancer research. Before the dedication, James Weichert, vice chairman of Weichert Companies, Joe McDonald, regional vice president of Weichert, Realtors®, and Laura Metro, central relations manager for Residential Sales at Weichert, Realtors®, enjoyed a tour of Hope Lodge and breakfast with patients and their caregivers. The American Cancer Society Hope Lodge program provides more than just free shelter for cancer patients and their caregivers; it’s a nurturing community that helps patients access the care they need. Each Hope Lodge community offers a supportive, home-like environment where guests can share a meal, join evening activities or unwind in their own private room. Patients staying at a Hope Lodge must be in active cancer treatment and permanently reside more than 40 miles or one hour away from their cancer treatment center. Each patient must be accompanied by a caregiver. The American Cancer Society Hope Lodge in New York City, which opened in 2007, offers 60 guest rooms located near treatment centers in the area. For more information, please visit www.weichert.com.